“Late” is 53 minutes and nine seconds long, and that includes the credits. In those minutes, Alexis Bledel utters not a single word. She only makes two, maybe three sounds. One of them is a moan of despair. The last is a a scream. It’s filled with rage and horror, lasting all of one second. It is the most cathartic, awful second of television you will see this year. There’s no way to truly know that, of course. 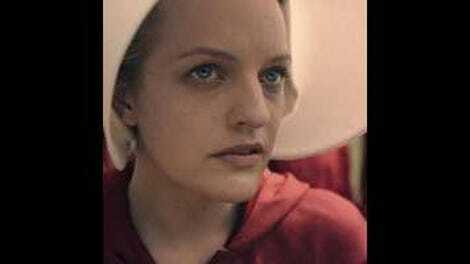 For one thing, there are seven episodes remaining in this season of The Handmaid’s Tale, and you don’t have to have read the book to know that there are horrors lying in wait down the road. In this instant, however, it’s difficult to imagine another moment like that one coming along: a sound of primal rage and grief, capping a performance that weakens the knees, chills the blood, and makes the air feel thin. That it’s a stunning technical and artistic achievement, both for Bledel and director Reed Morano, feels almost beside the point, and to praise them seems somehow small. And yet, to fail to recognize the skill and artistry that goes into creating such a moment would be to do these two women (as well as writer and showrunner Bruce Miller) a disservice. It would be all too easy to spend the entirety of this review marveling at the performance and the incredible filmmaking that so dominate “Late,” but that would be a disservice, too—to Elisabeth Moss, Yvonne Strahovski, and Madeline Brewer in particular. As such, we’ll return to Emily, as she’ll now be called in this reviews, later, and look instead at the episode as a whole. It’s a striking piece of television, as they all have been thus far, juxtaposing Offred’s new, everyday terror with Emily’s loss and mutilation. Both stories find the same link to the episode’s flashback sequences, which focus on the morning it became clear that a dark corner had been turned. These women need to be taken care of, this world believes, and care means control. No ice cream for you this month, young lady. In Offred’s case, the care and control emerge from two conflicting developments: the disappearance of the previous Ofglen, and the non-appearance of her period. When Offred walks in the door after her shopping trip with the new Ofglen, she’s met by Rita with excited warmth and a very pretty little lunch. Moss captures Offred’s befuddlement and alarm perfectly here—a rose means something, and any act of kindness must seem a warning bell in such a cruel and merciless environment—and that confusion only increases when Serena Joy enters. There’s something like nervous joy in Strahovski’s voice as she asks Offred if her breasts are tender. It’s a violation, but in light of the routine offenses these women endure, it seems downright mundane. We get much less narration from Offred in this installment than in previous episodes—though they do make room for one of the novel’s most striking lines—and it’s as though the puzzle facing her is so twisted that she can’t spare much time for inner monologue. Instead, it rests of Moss’s shoulders to tell us what’s going on: the realization that pregnancy means a temporary reprieve from some of the more grotesque elements of her situation; the knowledge that to give birth would mean to have her baby ripped away, as Angela was from her mother (and, briefly, from Offred herself); the fear of failure heightened by every tremulous, joyful look she gets from Serena Joy. Strahovski has been very good in the series thus far, but “Late” gives her more to do than the previous installments, and she more than rises to the challenge. Her attempts to engage with Offred are laced with desperation; it’s clear that all the humiliations and degradations—which she acknowledges here, however obliquely—will have been worth it, to Serena Joy at least, if it results in a baby. While their scenes at the Putnam’s are excellent, it’s that final interaction, in which a terrified, smiling Offred tells her “mistress” that she’s not pregnant—where Strahovski really lights a fire. It’s such a rapid reversal of fortune, and the motherly care and kindness she’d been exhibiting slides off her face like a runny egg. It’s matched in intensity by her equally quick transition from snarling menace, crouching above Offred like a predator, to dignified lady of the house, gliding from the room in perfect turquoise pumps while she clamps down on the tears. “Things can get much worse for you,” she says, and she’s right. Before this reversal, however, Serena Joy’s desire for a baby butts up directly against the desires of Aunt Lydia and a heavy named Burke (Jim Cummings), here representing the state. Their interrogation of Offred gives Moss what might be her finest moment of the episode, as her fear quietly gives way to a small rebellion, a desire to see her friend remembered (as Simple Minds suggested in the last episode). The cattle prod swings freely. Nick warns Offred that “Brave isn’t part of any of this,” but still she honors her friend—and perhaps friends, as we see so much of Moira in this episode, too. Dowd toe-to-toe with Moss is a dazzling proposition, but it’s hard to be appreciative of the great acting match-up when the content, and the performances, are so unsettling. That brings us neatly back to Bledel, an actor often relegated to playing variations-on-a-Gilmore. It’s hard to imagine that will be the case after the staggering achievement that is her performance in “Late.” Both she and Morano deserve every plaudit that comes their way, and their partnership here produces the single most upsetting shot (to date) in a series that’s well-supplied with upset. From the time Emily exits the prison to the end of the scene, there are very few cuts—most focus on the hands and eyes of Bledel and Laura Wilson, who plays Martha 6715-301—but the last is astonishing: a rolling shot that takes the pair to the site of Martha’s execution and stays with Emily as the van pulls away, her lover’s dangling body framed in the window. It’s difficult to say more about it. It’s difficult to address with a purely critical eye, though it’s more than worthy of such attention. That sequence, the 10-second trial, Bledel’s final scene with Dowd—they only grow deeper and more horrifying. These reviews began with an assertion that it’s strange to dissect a show that speaks for itself. The third will end with this: it’s equally as difficult to analyze something that’s sunk into your bones. “Late,” and Bledel’s performance in particular, has been sitting in my stomach for some time now, growing ever more powerful and sour. It has stunned me, critically and personally. It did, and does, exactly what it’s designed to do. Music in this episode: Peaches made me laugh out loud, in a gross and horrified kind of way; “Heart of Glass” was otherworldly, unsettling; and while I wish we’d heard a female voice, Jay Reatard’s raucous “Waiting for Something” could not have been more perfect for that final sequence. There wasn’t really a place to include it above, but Madeline Brewer was excellent here, too. That scene in her bedroom was something else. So was Samira Wiley, though those scenes were more about information than performance. There were some incredible shots in this thing, too many to include. If you’re interested, I’ll be sharing on Twitter. One notable exception to the variations-on-a-Gilmore rule: “Lady Lazarus” and other episodes of Mad Men.